Your Beloved Dog Deserves the BEST! That’s why, we have devised a never-like-before Probiotic formula for the best dog health care. 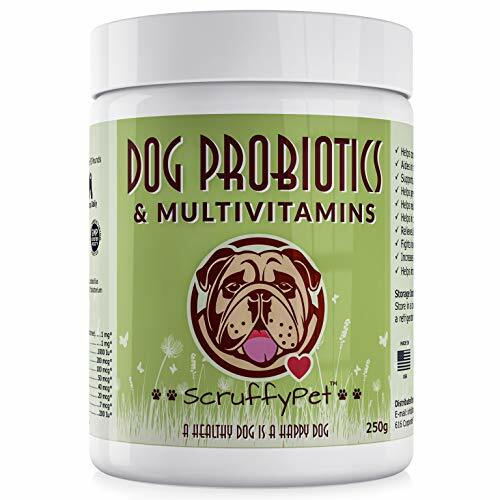 Unlike a slew of inferior products out there, ScruffyPet Probiotics with Multivitamins & Minerals brings the highest potency & variety in one complete package! Probiotics WITH Multivitamins AND Minerals? Vitamins and minerals, just like in humans, are crucial to maintaining your pet's health, assuring normal digestion, reproduction, muscle & bone growth & function, healthy skin & hair, use of fats, proteins & carbohydrates by the body. Deficiency can cause health problems. 250g-2 Billion CFU per scoop and over 360 Billion CFU per jar at the time of manufacturing. Probiotics help restore and maintain the proper balance of good and bad bacteria ensuring optimal digestive health which helps to improve & restore the flora in the gastrointestinal tract that is essential to a DOGS LIFE LONG HEALTH & WELL-BEING. If you and your pet aren’t satisfied and do not see a marked improvement within 28 days of purchase, we’ll refund you in full – we’re confident it won’t come to that! Give your dog the best health care & nutrition it so deserves. Click ‘Add to Cart’ to order the best Probiotics for dogs now! TWO GREAT PRODUCTS IN ONE - With 44 different NUTRIENTS, you get BOTH Probiotics plus Multivitamins & Minerals, which compliment each other and work extremely well together. 20 STRAINS OF PROBIOTICS - (2 BILLION CFUs PER SCOOP) 20 species of Probiotics have been used to enrich our PREBIOTIC INULIN based formula, which helps good bacteria GROW & FLOURISH! Ensuring optimum GASTROINTESTINAL & DIGESTIVE HEALTH. 21 MULTIVITAMINS & MINERALS - Will aid in keeping your pets skin & coat healthy, strengthen bones & teeth to further enhance overall ENERGY, HEALTH, VITALITY & WELLBEING, plus cranberry to aid in urinary tract health and Alpha-galoctosidase for gassiness. EASY DISPENSATION, NO CHOKING - Comes ready to dispense in powder form, which is Double sealed for FRESHNESS! Just add to your dog's food & that's it! PERFECT FOR ALL DOG BREEDS. MADE IN THE USA - At an FDA Registered & GMP Certified Facility - FREE OF ANY preservatives or chemicals. If within 28 days you and your pet aren't impressed, we will refund your entire purchase price in full. Scroll to the bottom of this page to see a more detailed product description. If you have any questions about this product by ScruffyPet, contact us by completing and submitting the form below. If you are looking for a specif part number, please include it with your message.